If you’re new to SharePoint, one of the first terms you’ll come across is Metadata. In this blog I’ll give you an overview and show you how to use metadata in a document library to summarize and “report” on data. I’ve done this on SharePoint 2013 / Office 365. For more information see “87 Terms Every Non-Technical SharePoint Professional Should Know” by Richard Harbridge. We’ve been working with metadata for many years – we just didn’t know it. On your PC, go to your Windows Explorer > Documents Library. (In the Details view) right-click on the column header and you’ll see that you can actually pick more properties to display from the list. Document Library: Name > Date Modified > Type > Size etc. Music Library: Name > Contributing Artist > Album > # > Title etc. Picture Library: Name > Date > Tags > Size > Rating > Dimensions etc. Video Library: Name > Date > Type > Size > Length etc. So each type of library on your pc has document properties related to that type of content. SharePoint has the same default properties related to content. The difference in SharePoint is that you can add your own unique properties. Build a document library – call it Performance appraisals. To add columns (metadata), go to Library Settings > Create Column. 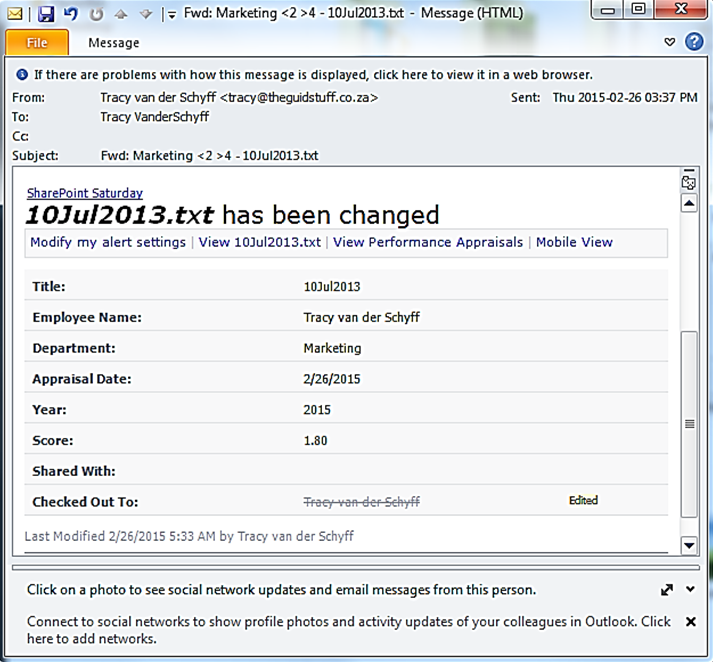 See the image below for the column types available in SharePoint. Create the following columns: Employee Name (Person or Group), Department (Choice / Managed Metadata), Appraisal Date (Date and time), Year (Choice) – these will be used for identification and views. Now add Score (number) which we’ll be using for ‘reporting’ and alerts. Now for the “reporting” bit…. The Marketing Director does not want to browse through all the appraisals. He only wants to know if someone in Marketing receives a score of either lower than 2, or higher than 4. Of course you can do this with some fancy workflows – but I’m going to do this with filtered views & alerts. You have to create the filtered view. 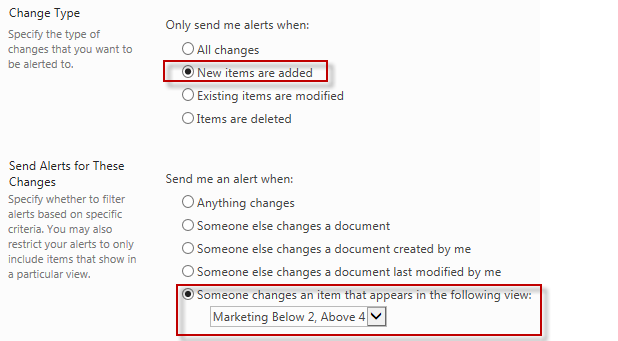 Following the steps above, create a view that only shows Marketing department documents that have a score above 4 or below 2. Most of us start the filter with Department = Marketing AND Score larger than 4 OR less than 2 (Image on the right). This however does not work because the conditions in operators are grouped from the beginning. Start with the possible conditions and end with the definite condition (Image on left). Once this view is created – we can now create an alert on this view to be sent to the Marketing Director.